What is this Palace in Turda? Turda is not the most beautiful city in Romania, or maybe my judgement is unfair because I drove through the town on a rainy and grey November day. But then this one building stood out due to its size and it’s atypical style. 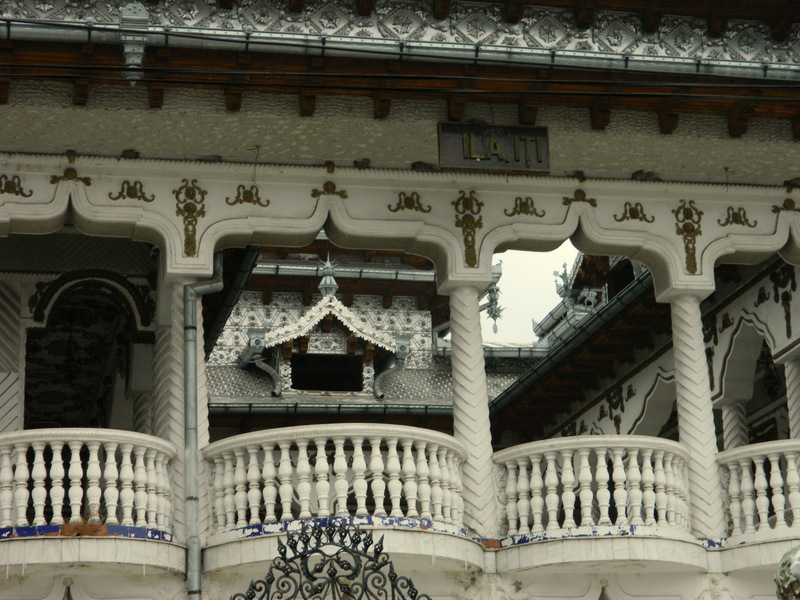 It looked like a Far-Eastern palace in the midst of one-storey Transylvanian houses. It did not appear to be too old, but it had already been deserted. Some of the letters of the sign on the facade had fallen off. Through broken windows, I could see fine tiles adorning the ceiling. Does anyone know the story behind this house? It is located at the corner of Strada Bicazului and Strada Albinei. Thank you for your help! UPDATE: On Twitter, someone pointed out this article, according to which it was the residential house of a Roma family. – And other EU countries are afraid of Romanian welfare seekers. They should take a look at this house (although admittedly not everyone around here lives like this). UPDATE 2: Thanks to everyone who replied! Several readers mentioned that there are whole villages consisting of palaces like these. I will need to visit Huedin and Buzescu. This entry was posted in Photography, Romania, Travel and tagged Turda. Bookmark the permalink. 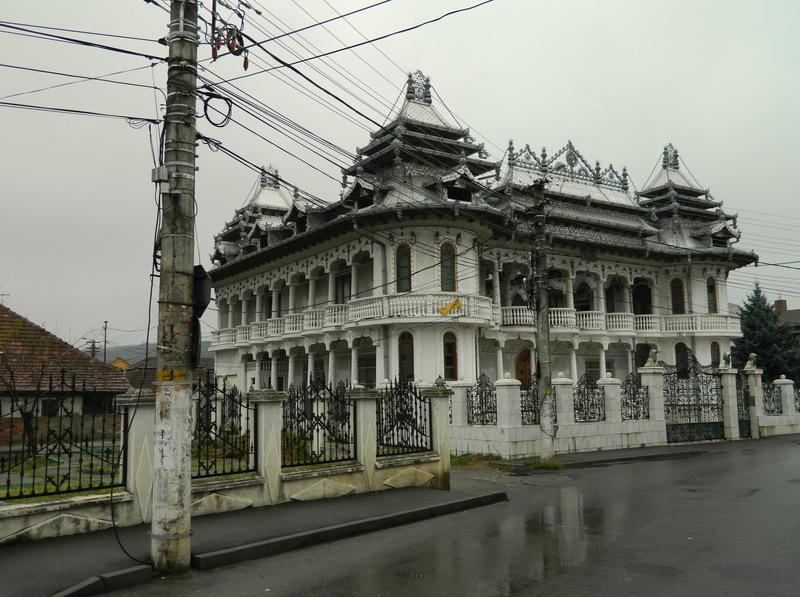 15 Responses to What is this Palace in Turda? Thanks for these links! On first sight, I thought the building looked Chinese, but in your second link it says it’s an Indian style. gypsy residence! with its’ “unique” architectural style..
very cool!! And I love the video you posted, too! True, you should visit the town also, it’s small but quite chic. And you can find some nice things there: the salt mine http://salinaturda.eu/?lang=en, the town center http://www.turdaturism.ro/new/, local churches, some roman springs wich I didn’t visit but I read about them, the monument of Mihai Viteazu and the monastery with the same name are near, also the entrance to Apuseni mountains and Turzii Gorges…wich are beautiful…but haven’t been there in 2-3 years..so I don’t know how things are looking now. So, next time, don’t just pass, make a stop or plan to go there. If you need more intro and secrets, let me know. And I also went for a walk up a hill next to Turzii Gorge. And I was excited to see your photos and read your report! The style is just as elaborate inside as it is outside. But all a bit too kitschy or “nouveaux riches” for my taste. In Transylvania, I prefer the old wooden houses or the grand buildings from the Habsburg time.